This blog offers an Australian perspective on faith, religion and spirituality. It invites you to join the joys and hope, the grief and anguish of a middle aged Aussie Catholic. The material reflects my interest in global as well as local issues.My perspective is probably more quirky than orthodox. Often when doing an online search for material I use the Google Image search tool as I am a visual type of person and love the images that take me to text. During these 12 Days of Christmas I suggest you visit the Google Image site for Australia Post Christmas Stamps. 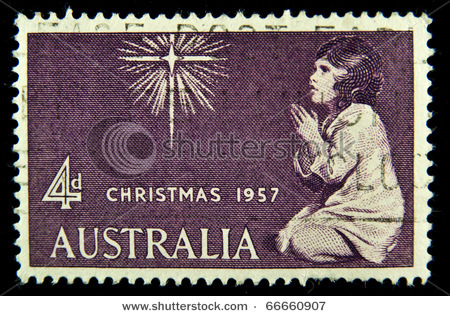 The history of Christmas stamps is rich and diverse.The Wikipedia article notes that: "The choice of secular or religious designs is frequently a bone of contention; church leaders often see secular designs as diluting the meaning of the holiday, while postal officials fear that overly religious designs could lead their secular customers to avoid the stamps, leaving millions unsold, and even expose the postal administration to charges that they are violating laws prohibiting the promotion of a particular religion. In the United States, annual discord over "secular" versus "religious" designs was resolved by issuing some of each; typically a group of 4-6 related secular designs, plus a Madonna and Child design. To avoid difficulties attendant upon contracting for original designs with a religious theme, the designs are based on Old Master paintings hanging in U.S. galleries, thus qualifying as depictions of art. The British Royal Mail resolves the difficulty by issuing "religious" and "secular" themed designs in alternate years." 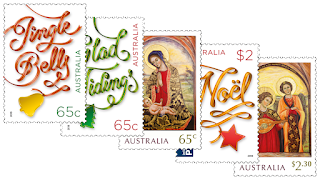 The 2017 Australian Christmas Stamp set included a Madonna and Child image that has great personal significance." 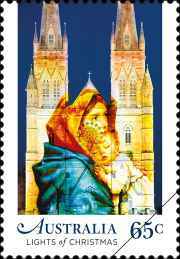 The 65c Christmas-card-rate stamp shows a projection from the 2013 Lights of Christmas display. The painting is a copy of a now lost work by Italian artist Roberto Ferruzzi (1853–1934). The much loved original painting, known as the Madonnina or the Madonna of the Streets, was awarded a major prize at the 1897 Venice Biennale. Often reproduced as a devotional image, it survives in countless copies." My childhood Christmas memories include the never ending series of cards that my parents received from relatives and friends. I think we even swapped (posted) cards to the neighbours. I'm not sure we followed the Christmas etiquette although I suspect the posting was done in time for cards to arrive before Christmas Day. I now have a custom of sending the cards during the Christmas season of the 12 Days as a bit of a protest that Australia Post only allows the use of the Christmas stamp up to the end of December. You can of course use if after the 31st but they expect you to add the extra 5c stamp to cover for normal postage rates. Advent 2018 Week Three: Gaudate! !